Happy Friday! I have another awesome ‘Diary of a Working Mom’ post for you. Today’s Q&A is with my friend Monica Bhatt. Monica is one smart lady who just happens to be my ‘almost’ neighbor. Our hope is Kaiden and her little girl Reyna, born about a month apart, become besties! I met Monica B. through our mutual friend Monica Shah years ago. I’ve always been impressed with her drive and work ethic, and now that she’s a mama, I’m that much more in awe of how she integrates her important role at work with her role as a mama to an almost one year old. I’m the Research Director of the Crime and Education Labs at the University of Chicago where I oversee a portfolio of research projects aimed at reducing violence and improving educational outcomes for young people in the City of Chicago. As part of our model, we generate questions in close partnership with the City of Chicago, including Chicago Public Schools, the Chicago Police Department, the Department of Family Support Services, the Mayor’s Office, and community based organizations. Then we try to develop evidence using rigorous methods like randomized controlled trials (which are not often used in the social sciences) to find out what some promising interventions might be to address pressing and persistent policy problems that disproportionately affect residents in high violence neighborhoods. I love my job – it is an incredible privilege to use my training as a social scientist to help improve the quality of services available to our city’s most vulnerable residents. But it does get busy! I’m usually the one to wake up with our daughter anywhere between 5-7 a.m. depending on the month/week/day. The inconsistency is maddening! I feed and hang out with Reyna while I get ready in the mornings until our nanny shows up at 8 a.m. This is my protected time. I’ve blocked my calendar until 9 a.m. most days so I don’t feel stressed about getting to work and can enjoy a leisurely 20-minute walk to the office, always stopping to get a coffee (Pret if I’m pressed for time; Sawada Matcha or Cafe Umbria if I want to treat myself). Then I’m usually in anywhere from 10-15 meetings a day from 9- 5 p.m., without a break for lunch most days. I told you it’s busy. Around 5 pm, I do my rounds with staff and try to triage anything I’ve missed over e-mail, developing my to-do list for the evening and answering anything urgent. I usually either walk home around 5:45 to be home by 6:00 p.m. to relieve the nanny or I have an after-work engagement and get home anywhere from 6-7 to put Reyna to bed. 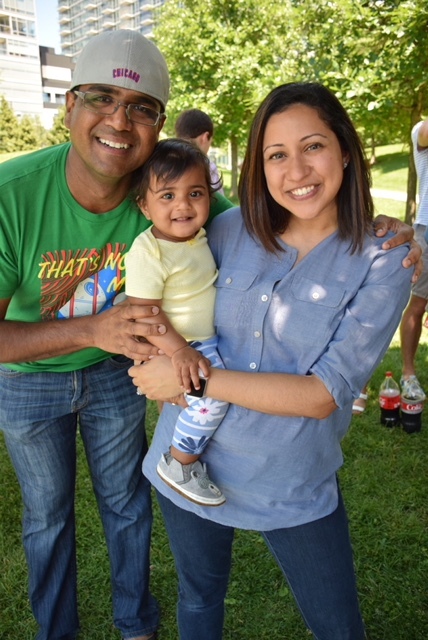 If I’m home by 6, we go for a family walk or play inside until the bedtime routine starts, usually around 7:00 p.m. Srinu and I like to do it all together, including bath time, making her a bottle, reading stories, and putting her to bed. She’s in bed and asleep by 7:45 p.m. most nights, after which we eat dinner and catch up for about a half hour to an hour. Around 8:30 p.m. I get back online until I go to bed around 10:45, saving a few minutes to read before I go to sleep, only to start it all over again in the morning! It is not normal to have young people be subject to trauma and violence in the way some children are in Chicago. These children are born into communities that have suffered systematic disinvestment over many years. Even before I had Reyna, I felt like we were doing a disservice if we didn’t try to provide for all kids what we would for our own. After having Reyna, I think about the difference in her upbringing versus some of her peers’ constantly, and if anything, I feel even more committed to doing this work. That being said, I don’t think my role has changed per say, which is part of the problem – being a mom has definitely decreased the amount of time I have to do this work as now I have the same busy job as before plus a kid! It’s motivated me to figure out how to prioritize what to work on. At first (and maybe even now), I was trying to just do it all and cram in extra hours in the evenings or on the weekends as part of the “second shift.” But increasingly I’m realizing I just cannot do the volume of work I used to before when my strategy would be to just work longer. Instead, I need to figure out how to work smarter, and that likely means trying to do more intellectual work like reading and writing during the work day instead of shafting those things to the evening. And that requires fewer meetings, somehow. Granted, I haven’t quite figured out how to do this, but it’s something I strive for! Favorite tip on how to integrate work and life? Er, yikes. I’m not sure I have one! Maybe I should read MIS for tips. 🙂 The only real stipulation I’ve imposed on my job is that I don’t start my day before 9 a.m. if I can help it with respect to meetings. That means I have my mornings to wake up and spend time with Reyna without feeling rushed, including a leisurely (ish) walk to work and stopping to get a coffee. I’m very much about finding “little pockets of joy” wherever I can – whether it’s a favorite little treat, an extra few blocks of walking in the sunshine, taking the extra time to take a long shower and blow dry my hair straight, reading a novel instead of a report before bed, etc. To be honest, I don’t really have mom guilt. This was the most surprising thing about being a working parent, since I had read so much about how hard it is and how guilty you feel all the time. I love my job and I love my kid, and while sometimes it’s all a bit much, I don’t feel guilty for being away from Reyna (yet at least). In my mind, I’m a better parent than I would be if I spent all my time with her because I’m happy doing what I love and she’s happy being with someone who enjoys being around babies all day. See above re: lack of guilt. I expected it to feel stressful all the time. Granted, there are reasons why I am able to enjoy this time more than most – I have a supportive partner who splits childcare duties in a truly 50/50 manner; we both have well-paying jobs that provide fulfillment and some degree of flexibility autonomy; we have resources to counterbalance the fact that we have little out-of-work time; etc. But still, I thought it would be harder. While there are moments when it feels relentless or overwhelming, the majority of the time I feel happy and not guilty about having to “balance it all.” I still do fun things. I still have a social life, I still read for fun. I just have a lot less time to do those things, is all. And if there are things I no longer do (read: working out!) I can only say it’s because I don’t prioritize it enough to figure out a way to make it work, not because I technically don’t have time. The most rewarding thing is definitely having many more moments where I am away from my phone or e-mail and just enjoying some baby laughter or playing or seeing the world through Reyna’s eyes. I never did this enough before and now when I come home I’m offline until Reyna goes to bed and enjoying family time and same in the morning before I go to work. Some mornings, Reyna will pull down the blanket on our couch, which I know is the signal for “Let’s read books!” She’ll sit on the couch while I grab a basket of books and squeals with delight when I bring them to her and then we read them ALL. It’s the best. If ‘me’ time is time away from work or Reyna, I would have to say I tend to fill it with spending time with friends. This means I don’t often get alone or down time, but I’m just not willing to forego already diminished time to nurture friendships, which really are important to me! The other thing I haven’t given up is season tickets to The Goodman Theater. I love watching plays – anything, really – and this is something I break for no matter how busy things are at work or life. As far as my guilty pleasure…rom coms. Definitely rom coms! The cheesier the better. The best piece of advice I received was from another new-mom friend who reminded me that even if some days I felt I wasn’t as good at my job as B.B. (Before Baby), my operating at less than 100% was still above and beyond what most people would contribute for the role. That made me feel much better about letting a few things slide from time to time! 10. What advice would you give to mamas-to-be about returning back to work? Play the long game and keep it simple. People will give you lots and lots (and lots and lots) of advice, but remember, at the end of the day, all your baby needs is a safe, nurturing environment and for you to love him/her. Everything else is just details. Love reading about all these bad-a$$ working mamas! Glad you’re enjoying all of these Q&As! !